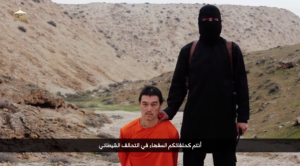 A hostage beheaded by ISIS. Photo: Twitter. The intensified public discussion about the root causes of violent extremism has focused mainly on the socio-economic and political conditions that exist in Arab countries and among Arab communities in Europe and the US, which provide a breeding ground for extremism. But to effectively counter violent extremism, we must also carefully consider how the development of events in the wake of World Wars I and II have impacted the psychological disposition of the Arab population throughout the Middle East. Starting with the arbitrary division of the region by Western powers, the wars, revolutions, and scores of violent conflicts that followed have added layer upon layer of deep resentment and hatred of the West, and the puppet Arab leaders that were installed to serve their Western masters. The following provides a brief historic, panoramic view of what the vast majority of the Arab population has experienced, which has informed their perception of the world around them, left an indelible mark on their psyche, and framed their beliefs and behavior. Whether the colonial powers were only partially or fully to blame is hardly relevant because the Arab masses continue to believe that colonialism was behind the ills and suffering they endured. From the perspective of the majority of the Arabs, the developments of major events that followed the two World Wars simply confirmed their perception. Even before the collapse of the Ottoman Empire in World War I, Britain and France reached a secret pact in 1916 (the Sykes-Picot Agreement) to divide Ottoman-held territories in the Middle East between the two powers irrespective of sect, ethnicity, and religious affiliations. Dividing the ‘pie’ between them was viewed as exploitive, arrogant, and dismissive of the welfare of the indigenous populations, ushering in decades of strife and turmoil. The creation of most of the Arab states following World War II hardly changed the plight of the Arabs living in these countries. The French and the British appointed governors, kings, and emirs who ruled with iron fists, further intensifying hatred toward the Western powers and toward the authoritarian regimes under which they groaned. The establishment of the State of Israel in 1948 was regarded as yet another Western conspiracy. The humiliation of the Arab armies by the nascent Israeli forces, the loss of substantial territory, and the creation of the Palestinian refugees have added a further layer of deep resentment. The Israeli occupation, which led to the rise of Hamas and Hezbollah, continues to feed the Palestinians a daily ration of indignity to this very day. The 1953 overthrow of the freely-elected Mosaddegh government in Iran, engineered by the CIA and British intelligence because of the parliament’s decision to nationalize the oil industry, was seen as the most flagrant intervention in the internal affairs of a Muslim state. The installation of the Shah, a Western puppet, and his ruthless treatment of his subjects was never forgotten by the Iranians and still remains a source of anger and antipathy toward the US. When Gamal Abdel Nasser, who was hailed as a nationalist hero, rose to power in Egypt and dared to challenge the West’s dominance and ‘ownership’ of the Suez Canal, the French and British, in cahoots with Israel, answered with war. The war with Egypt once again trampled Arab pride as the retaking of the Canal and the occupation of the Sinai by Israel was viewed by the Arabs as a blatant manifestation of the West’s vulgarity of self-entitlement and Israel’s hunger for more Arab land. And then came the 1967 Six Day War. In 144 hours, Israel conquered Egyptian, Syrian, and Jordanian territories more than three times its own size. Though their defeat on the battlefield was humiliating, it was the psychological defeat that shattered the Arabs’ self-esteem. Although the 1973 Yom Kippur War salvaged Egypt’s national pride (Egyptian forces were allowed to remain on the East side of the Suez Canal, which provided Anwar Sadat a political victory), it did little to allay the Arabs’ humiliation as Israel continued to occupy Arab land on three fronts. The 1979 Iranian revolution marked the first major Muslim country to revolt against the United States, sending a clear message to Arabs and Muslims that the West will no longer impose its whims with impunity. Unsurprisingly, the Mullahs’ victory did not change the core resentment and hatred toward the West. Although the 2001 Afghanistan war was arguably necessary to destroy al Qaeda following the 9/11 attack, the prolongation of the war, its destruction, and the death toll were and continue to be seen as consequences of the West’s never-satisfied appetite for dominating Muslim/Arab lands. The Afghanistan war produced a new generation of militant Muslims that operated both with and independent of al Qaeda, ready to challenge Western powers and the autocratic Arab regimes that want to maintain the status quo. Notwithstanding how much Saddam Hussein was reviled for his ruthlessness, the vast majority of Arab youth viewed the 2003 Iraq War as an unprecedented assault on the Arabs’ heartland and people. Iraq was essentially dismantled, pitting Sunnis against the Shiite majority; tens of thousands were killed and violent Islamists converged into Iraq, which eventually led to the birth of ISIS while poisoning a new generation of young Arabs with intensely anti-Western sentiments. The Arab Spring, which ushered in great hope and promise for the future, turned out to be a cruel winter. The US and the EU have selectively interfered in the various Arab Spring countries without any clear strategy, believing that pushing democracy down the throat of the people would provide a panacea for their political ills. All considered, the vast majority of the Arab people accept their lot in silent desperation. But the relatively small minority who are engaged in violent extremism rose to defy by whatever means both Western powers and the authoritarian Arab regimes. These jihadists differ in age, financial ability, education and family prominence, they do not fit a single profile nor do they follow a single path to extremism. However, they all have one thing in common: hatred of the West and their corrupt leaders. They no longer believe that their governments will heed their call for change; they believe Western influence is a curse and only jihad can change their destiny and the course of history. Religious extremism and the deliberate distortion of Islamic teaching provided the outlet that could justify any violent action to remedy decades of servitude and subjugation. Dying while fighting the enemy is extolled as martyrdom, the ultimate sacrifice that opens the gates of heaven and offers true freedom and dignity, of which they were deprived on earth. Though the use of force is at times necessary to destroy an irredeemable foe such as ISIS, it is critical to recognize that no amount of military force can eradicate ideology and religious conviction. A multitude of measures are necessary to counter violent extremism, including education, economic assistance, job opportunities, integration, addressing grievances, engagement in social activities, and much more. But to successfully combat this long-term, Western powers must act on a number of fronts to set the stage for reconciliation. Reconciliation must begin by recognizing and admitting to past mistakes. Regardless of the extent of the West’s abuse and exploitation of Arab resources and people, acknowledging its long history of misguided policies is critical to establish a dialogue which is still largely missing in the strategy of countering violent extremism. The West can offer a model of democratic government, but must not impose it arbitrarily. The Arab states will find their own way to reconcile religion with the form of democracy they choose, and the West must honor the outcome of fair and free elections. The West owes many of the Arab states, especially those with overwhelmingly poor populations such as Egypt, the financial and technical support needed to embark on sustainable economic development projects that empower the people. Poor, hungry, and despairing youth need food even before freedom, and job opportunities, healthcare, and education before meaningless elections. The US must never cease its effort to diffuse the Israeli-Palestinian conflict and bring an end to the occupation, which provides a continuing source of extremism. In doing so, the US addresses one of the Arabs’ foremost grievances against it, while strengthening Israel’s national security. Finally, since the West and the Arab states have a common interest in degrading, if not eliminating, radical militants, their collaboration must be strategic in order to avoid the potential of creating a new crisis. Does the US know what the fate of Syria and Iraq will be once ISIS is defeated, and how that will impact the Sunni-Shiite ‘war’ spearheaded by Saudi Arabia and Iran? None of the above is meant to suggest that the Arab states have been merely the victims of imperialism. They have and continue to contribute to the plight of their people. The Arab world is rampant with inequality, gross human rights violations, and tens of millions of poverty-stricken young men and women with little prospect of finding a meaningful purpose to their lives. If the Arab leaders want to end the scourge of violent extremism, they must assume some responsibility and not simply blame the West for their grievances and decades of socio-economic and political dislocation and despair. Unless they invest now in economic development, education, healthcare, and opportunities for growth, and allow for social and political freedom (albeit gradually), the radicalization of the young will only be intensified and the unforgiving storm will continue to sweep one country after another. To be sure, countering violent radicalism will be a long and costly campaign. It will take foresight, courage, and wisdom to learn from past mistakes. Together with the West, the Arab states must chart a new course of trust and mutual respect to tackle the herculean job that lies ahead.